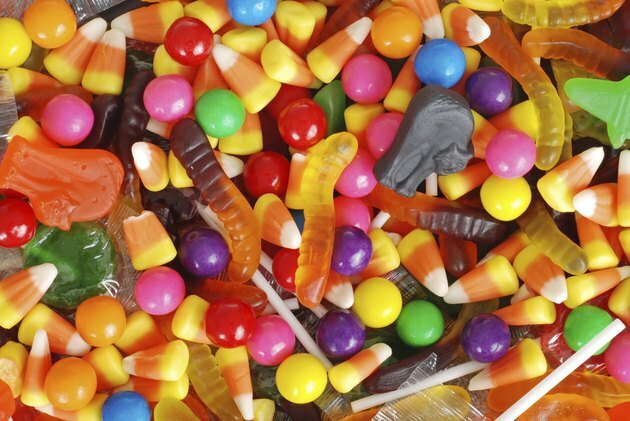 Can You Eat Sugar-Free Candy on the Atkins Diet? The Atkins diet recommends restricting your daily carb intake by eliminating starchy foods as well as all foods containing natural or added sugar. Sweets and candies are rich in sugar and therefore not appropriate if you are trying to lose weight by following the Atkins diet. Sugar-free candies and treats are now available at most grocery stores. You can eat them on your Atkins diet if they don't interfere with your overall progress. Sugar-free candies do not contain any added sugar and are sweetened with artificial sweetener. Sugar substitute, such as sucralose or aspartame, as well as sugar alcohols, such as sucralose, maltose, isomalt, mannitol and xylitol, are the most common sweeteners used in sugar-free candies. Although sugar-free candies cannot contain added sugar, they may still contain carbohydrates. Always check the label to determine the net carb content of the sugar-free candies you want to eat to see if they are a suitable option for the Atkins diet. Depending on the phase of the Atkins diet you are following, most Atkins dieters need to restrict your daily net carb intake somewhere between 20 grams and 100 grams a day. The net carbs correspond to the amount of carbs left once fiber and sugar alcohols have been subtracted. For example, if your sugar-free candies contain 20 grams of carbohydrates, 0 grams of fiber and 17 grams of sugar alcohol per serving, their net carb content will correspond to 3 grams. Count these 3 grams of net carbs as part of your daily net carb intake to ensure your stay within your net carb budget. Sugar alcohols are not considered in your net carb intake because you can subtract them from the total carb content of your sugar-free candies. Although sugar alcohols do not provide as much calories and energy compared to regular sugar, some people can still experience a rise in blood sugar levels after eating sugar alcohols. If you have a blood glucose meter, check how you react to sugar alcohols if they are part of the ingredients of your sugar-free candies. Many people can also experience gastrointestinal distress when consuming more than 10 grams of sugar alcohols per day, so keep your serving size reasonable. Although sugar-free candies are a good way to satisfy your sweet tooth without contributing many net carbs to your daily net carb intake, they could trigger sugar cravings. If you believe that your sugar-free candies are making you crave more sugar while following your Atkins diet, it may be best not to eat them. The best way to see if your sugar-free candies are interfering with your weight loss progress while following the Atkins diet is to track your progress on a weekly basis. Stay on track with your daily net carb intake, which should include the net carbs provided by your sugar-free candies, and weigh yourself at the same time of the day every week. If you are not losing weight, stop eating the sugar-free candies. Not getting results with sugar-free candies could be the result of having sugar cravings leading you to overeat or the sugar alcohol raising your blood sugar levels.